You are at:Home»Women's Kitty»Empowering»Check out the Coolest Grandma of the Year Who Plays Table Tennis in Saree! 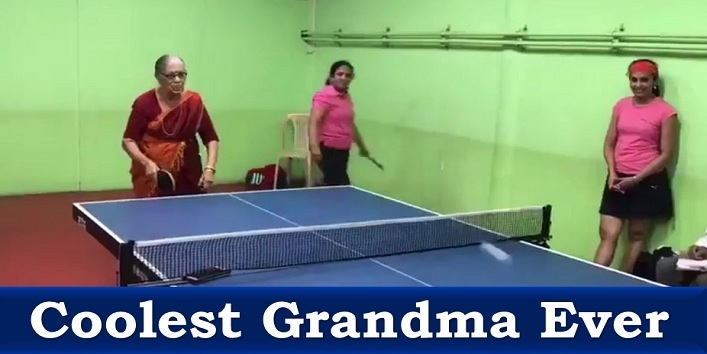 Check out the Coolest Grandma of the Year Who Plays Table Tennis in Saree! Dreams are not subjected to qualification and age. Determination and passion is the thing that helps you keep moving and working to follow your dream. And when it comes to a woman and her dreams, she makes sure to take every possible productive step to fulfill it. Since ages, we have seen women making their mark in different sectors despite facing objections and repulsion. There several women leaders, artists, leaders, and entrepreneurs who have started from a zero and struck big. These women are now the role models and the public figures that inspire millions of people to pursue their dreams without thinking much about the outcome. Taking this note forward we present you the story of a woman who is doing fab job irrespective of her age. Also read: Inspired By Dangal Movie This Akhada Encourages Women Wrestling For The First Time In 478 Years! Saraswathi Rao, former Indian table tennis player, who is 69 years old and still making people amaze with her activities. She is a cool grandma who wears glasses, saree and rocks the table with her moves. She graced the occasion of Karnataka Veterans State Ranking and showed some of her amazing moves to grab everyone’s attention. Last week, she also showcased her TT skills in the veterans TT tournament in Malleswaram, Bengaluru. And even a video is also out in which we can see her smashing strokes and energy that she spread all over.